Novels in Verse…Not just for girls! Many of the 7th grade girls I teach LOVE novels written in verse. They devour anything by Sonya Sones, and then I usually steer them to Karen Hesse and others who seem to capture that same magic but in different ways. Novels in verse, well written, pack a lot of punch with few words, and they usually offer lots of white space on the page, so they’re fantastic for reluctant readers. I haven’t found too many that appeal to boys, though, which I why I was so happy to read these two standouts in the books nominated for the CYBILS. 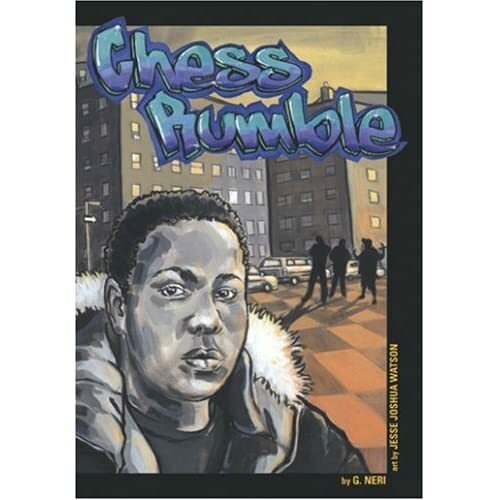 G. Neri’s CHESS RUMBLE is appealing to reluctant readers, especially boys, on a number of levels. Neri nails the voice of a boy growing up in the inner city in a way that’s reminiscent of Walter Dean Myers. Neri’s main character, Marcus, is a young man dealing with family troubles and fights at school, until he meets a powerful mentor and learns to fight his battles on a chessboard instead. This novella in verse is full of language that’s vivid and accessible, and Jesse Joshua Watson’s illustrations in shades of black, brown, and gray help to set the mood. This one has serious kid-appeal — not just for the kids who already love to read but for those who don’t often find books on the library shelves that seem to be written for them. This one is. Katherine Applegate’s HOME OF THE BRAVE is another novel in verse that will appeal to boys as well as girls. It may help that plenty of middle grade readers already know Applegate from the ANIMORPHS series, but this book has a completely different feel to it. HOME OF THE BRAVE is about Kek, a Sudanese immigrant who recently arrived in America after witnessing the death of his father and brother. He left his mother behind and wonders every day if she is alive. The poems that explore Kek’s emotional state are poignant and accessible to young readers, and the more traumatic scenes are set alongside lighter stories of Kek adapting to life in America and experiencing new things, from snow to washing machines. This is a kid-friendly story (those who love animals will have an additional connection) that explores a dramatic issue in current events in a manner that is personal, sensitive, and hopeful. This entry was posted in Uncategorized and tagged chess rumble, cybils, feiwel & friends, g neri, home of the brave, katherine applegate, lee & low books, middle grade fiction. Bookmark the permalink. Both comments and trackbacks are currently closed.